Costume Design for the Ballet "Piedigrotta"
Acquired directly from the artist by Leonide Massine, Rome & Paris. Acquired from the above by the present owner in the 1960s. Hartford, Connecticut, USA, Wadsworth Atheneum, Massine Collection, 1935, no. 47. The authenticity of this work has been confirmed by Maurizio Faggiolo dell'Arco, who will include the work in the forthcoming Giacomo Balla catalogue raisonné. With its dynamic collage of triangles and half moons, this study for a theatre costume depicts an automaton-like figure seemingly spiralling in motion. Reflecting the Futurist aims of Balla's art of this period, this elaborate collage outlines a concept of space that Balla described as having "more to do with the voices of the infinite than with our own". Like much of his work this costume design aimed at capturing the essence of its subject rather than its precise form and displays an intense interest in lines of force and motion. 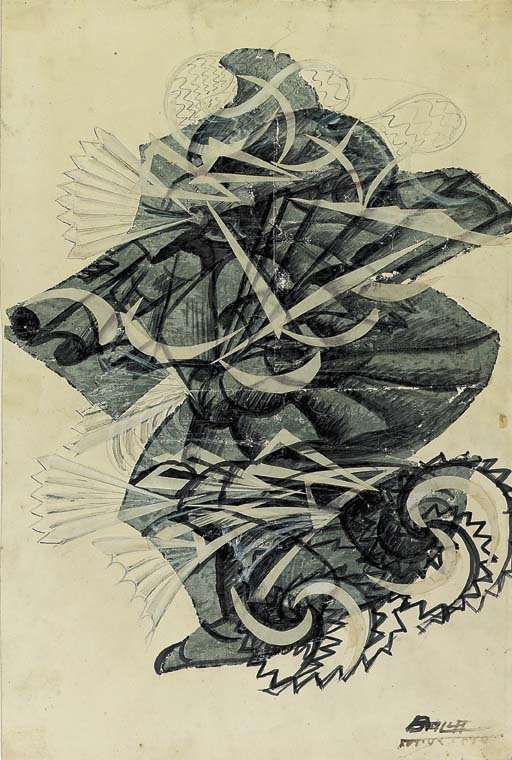 One the most remarkable of a series of sketches that Balla produced for the Diaghilev Ballets Russes was originally one of a number of outstanding avant-garde works in the collection of the great ballet dancer and choreographer Leonid Massine. Dating from the period when Massine and the Ballet Russes were performing in Rome, it portrays a figure moving its feet in a spiral and its hands in a zig-zag. These actions relate closely to experiments the Ballet Russes were doing at this time with the notion of time and velocity . On the back of the collage a note in Balla's hand renders the phonetic transcription "Balla Costume - Prete Grosso". This most probably refers to a planned performance of the famous Pedigrotta by Francesco Canguillo, a ballet student and colleague of Balla's who amongst other things had recently collaborated with the artist in a Futurist perfomance given at the Galleria Sproveri. Unfortunately the planned performance of Pedigrotta never took place, and this work entered the collection of Massine. Massine may have included it in an exhibition of his collection that took place in the foyer of the Constanzi Theatre in Rome, which was held on the occasion of the opening performance in April 1917 of Igor Stravinsky's ballet Feu d'Artifice which had also been conceived by Balla and for which Massine was the primo ballerino. We are very grateful to Maurizio Faggiolo dell'Arco for his assistance in compiling this catalogue note. Please note that the date for the exhibition at the Wadsworth Atheneum, Connecticut, USA is 1935.